The east end of the Zvolen - Kosice main line has a sparse passenger service consisting of a few fast trains hauled by class 754 diesels and even fewer locals worked by 4-wheel railbuses. However, freight traffic is heavy for a diesel worked route and most of the freights are worked by class 751 diesels, often in pairs. The line runs through the attractive Karst landscape of the Slovensky Kras, an area of high rounded hills and broad valleys. The route from Vrutky to Zvolen via Banska Bystrica is central Slovakia’s most important north - south link and carries significant volumes of freight and passenger traffic. The south end of the line is electrified but most trains are still diesel hauled. The most interesting section is north of Banska Bystrica where the line climbs through the mountains to a tunnel under the Maly Sturec Pass, giving access to broad Turiec Valley that runs north to Vrutky. This rural secondary line forms the main part of the secondary route from Presov to Humenne and had a good loco hauled passenger service in 2003. Despite an influx of 4-wheel railbuses, there were still a few loco hauled trains in 2011. 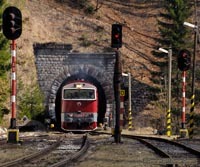 The line runs through attractive countryside with a summit in tunnel east of Lipniky and some impressive viaducts west of Hanusovce nad Toplou.